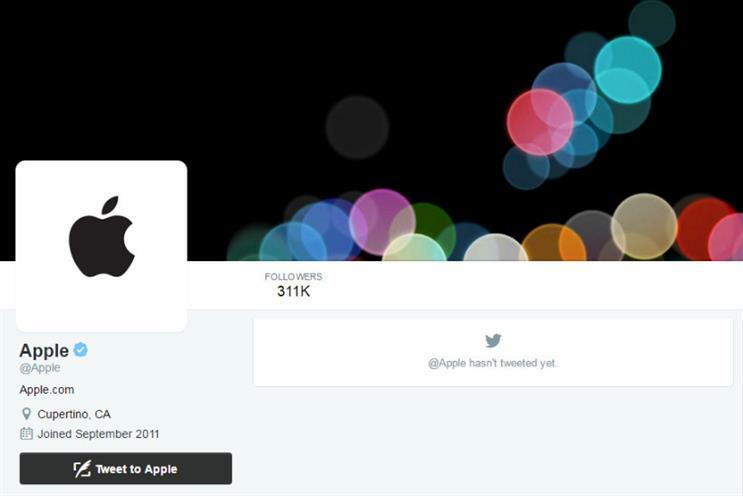 Apple has finally joined Twitter, days ahead of the expected iPhone 7 launch on 7 September. The company's social media account, @apple, has been verified as authentic by Twitter, but has yet to put up any posts. It already has over 300,000 followers, and the bio simply reads "Apple.com". The bio states that @Apple joined Twitter in September 2011, but the account has lain dormant and unverified until now. The move is significant because Apple has generally shied away from social media as a two-way form of communication. In recent years, it has slowly stepped into social media, opening Instagram, Twitter and Snapchat accounts for Apple Music, and Twitter accounts for iTunes and iBooks. Apple is also active on YouTube, but does not allow comments on its videos. Chief executive Tim Cook and marketing boss Phil Schiller also use Twitter. The company has begun liveblogging its events on its website, but it's likely Apple will use Twitter to live tweet the upcoming 7 September event, when the iPhone 7 is expected to be announced. One giveaway is that Apple's Twitter background image features the same bubble image being used to promote the iPhone 7 event. A number of details have leaked ahead of the iPhone 7's launch, with the phone reportedly expected to come in 4.7in and 5.5in versions, have a new colour option of black or blue, offer a dual lens camera, and not come with a headphone jack so that users may have to buy wireless headphones.